Dance Floor Performance: ANSI E1.26 | ASET Services, Inc.
ASET provides independent 3rd party testing of dance surfaces to ANSI E1.26. This standard was developed by ESTA (Entertainment Services and Technology Association) and approved by ANSI in 2006. This is the most common safety and comfort standard used within the dance industry. It includes evaluations of Shock Absorption, Standard Deformation and Deformation Depression. We have evaluated permanent and portable dance floor solutions in our laboratory, and we have evaluated numerous rehearsal and dance halls throughout the United States. We provide testing of new dance floors to ensure that they meet the specified performance levels. We also provide on-site testing to determine if existing surfaces comply with the standard. 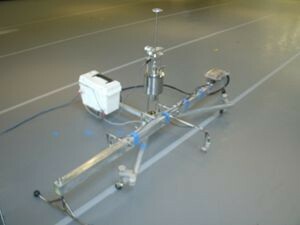 In addition to the standardized tests included in ANSI E1.26 we have the equipment to evaluate the energy returned to the dancer during the impact and other key properties of the dance surface that may make one surface preferable to another with similar or identical performance as evaluated by ANSI E1.26. ASET has worked with number of dance floor manufacturers and designers by providing testing used for research, product development and to meet industry specifications. ASET offers installation services of most systems within our lab saving clients valuable travel and salary expenses. We also offer friction testing of dance surfaces using ASTM E303 and other friction test methods. To learn more about our testing services for dance floors please Contact us.